The Tyrolia name has been synonymous with skiing since before I started as a wee ripper. It's therefore only natural that after amassing 80 years of binding know-how that this alpine brand would enter back into the growing alpine touring space in order to compete with the likes of Marker and Salomon. 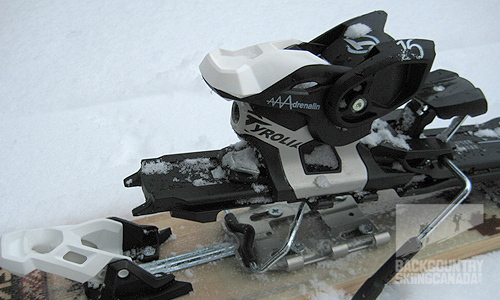 (Yes, Tyrolia had been a manufacturer of AT bindings in the 80's and even as early as the 50's). Having sold a whopping 1,087,000 bindings since 2008 you could say that Tyrolia knows a thing or two about attaching ski boots to skis. 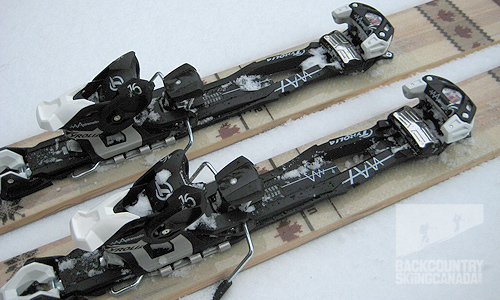 It also doesn't hurt that the parent company HTM Group also owns Head skis. So enough about the past, lets talk about the here and now; the Tyrolia Adrenaline is the new alpine touring binding that Tyrolia introduced last year and we finally got our hands on a pair to run through the paces. We have to state right off the bat that this binding is classified under the "Freeride Touring Binding" category and would compare with the Marker Duke, Salomon Guardian and Atomic Tracker (which is one in the same as the Guardian). 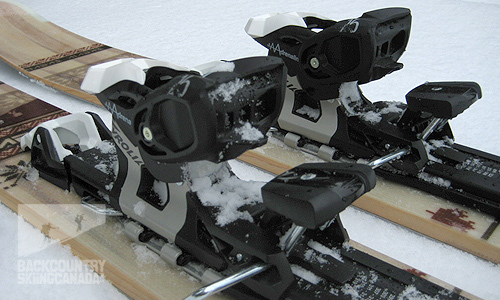 At 2.65 kilos these are not light weight bindings but they aren't meant to be. The Tyrolia Adrenaline Binding is designed for those who want to ski the resort and hit a few sidecountry laps or go for a day tour. Confidence to ski hard and go big is the Adrenaline's main advantage and thus justifies the weight. At just under 6 pounds per pair the Tyrolia Adrenaline wins top honours as the lightest of the heavyweights we mentioned above. It’s still a pound heavier (or roughly 400 grams) than Fritschi’s Freeride bindings but lighter than the Marker Duke by 160g and the Salomon Guardian by 340g. There are three walk modes on the Adrenaline: 0-degree rise for flat terrain, 7 degrees incline for low angle and 13 degrees rise for steep climbs. The "In-control climbing aid"(or riser as I typically call them) is positioned directly under the heal for ideal support, stability and transmission of forces from your weight when skinning up. 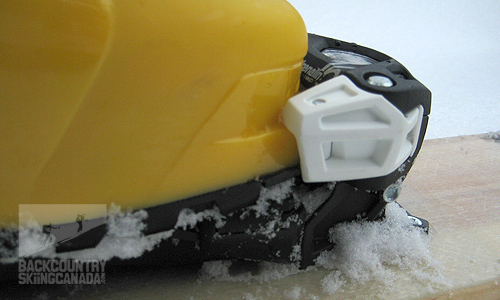 To engage the riser you simply push it down from under the heel plate and to adjust it you again use your ski pole to move it as on other Freeride Touring Bindings. At 80mm wide the riser is very stable and the combination of metal and thermoplastic elastometers reduces noise and the force of the impact with each heel strike. The big benefit of the Tyrolia Adrenaline design is that you do not have to take your skis off to switch from ski to walk mode and back again like you do with the Marker bindings. 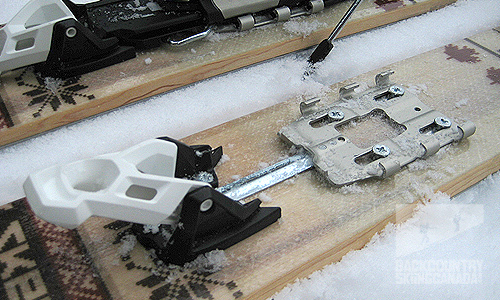 The heel lever works the lock mechanism, here the binding is in ski mode. The riser is engaged and provides an climbing angle of seven degrees. The riser is now at thirteen degrees of rise. There is very little plastic used in the design of the Tyrolia Adrenaline AT Binding; you'll only find plastic on the non-load bearing sections except, of course, for the the binding plate itself. This was obviously for weight savings as the binging plate itself is reinforced with a cross work of supports and bracing on the underside to ensure it remains rigid and strong. The framework of the heal piece and the locking mechanism is a different story though as it is made of titanal alloy for light weight stability and reliable security. This Titanal heal brace and track will limit wear like you would find on plastic bindings such as those from Diamir Fritschi. 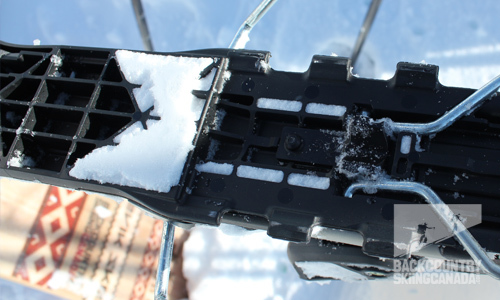 When in ski mode the heel piece is secured to the ski with a similar system as the Marker AT bindings as it slides contact point over the heel plate thus eliminating any lateral play like that found in the Salomon Guardian bindings. A secure fit for both alpine and alpine touring DIN boots. The metal plate slides to lock down the heal and has six connection points to hold your boot tight. 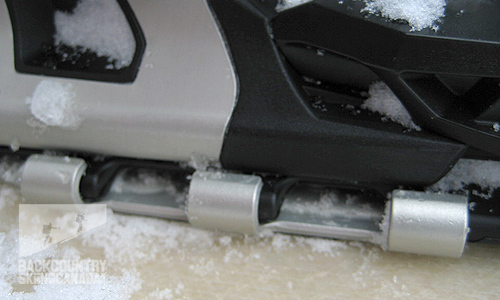 Here you can see a close up of these points keeping the binding securely locked down in ski mode. 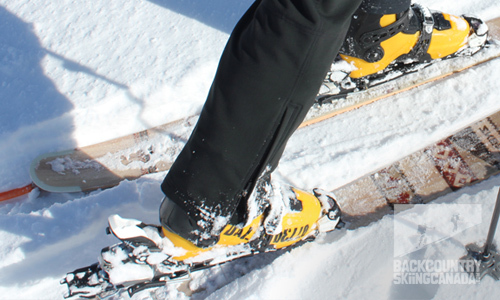 In ski mode your boot will rest 36mm above your ski which is not ideal for sensitivity, but great for leveraging your ski on edge. 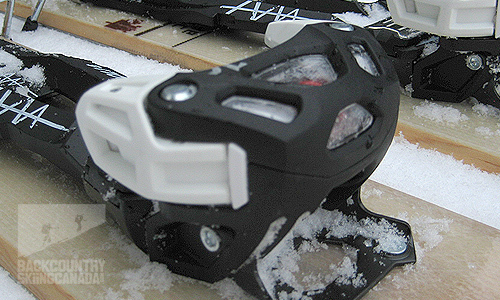 The big feature in the heel though is the fact that it is not fixed to the ski, instead it floats on the base plate track to allow for ski flex thus eliminating the dead spot found on other alpine touring bindings. 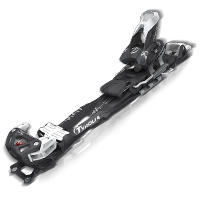 This combined with the extra-wide track that keeps you locked down allows for increased power transmission to the ski and overall better stability than the competition. Moving on up to the toe piece you will again find titanal metal which, this time, in the bracket that attaches the toe piece to the ski. The "Freeride" toe design as Tyrolia calls it incorporates a stainless steel AFD (Anti-Friction Device) that moves laterally to allow for better toe release regardless if you use alpine boots or alpine touring boots (as each of these conform to different DIN standards). Two rollers integrated into the toe piece arms again aid in the easy release of whichever ski boot you choose to ride in and also help re-centre your boot when a total release is not needed. The ability to accept alpine and alpine touring boots is a huge plus for the Tyrolia Adrenaline bindings over it's competitor the Salomon Guardian as they are an alpine DIN binding only. The Tyrolia Adrenaline is available in two lengths, the shorter is for boot soles between 270-330mm while the longer accommodates boot soles lengths between 300-360mm. Since the bindings will fit a variety of ski widths the Adrenaline Binding does not come with brakes instead you purchase those separately depending upon which size you need, 88mm, 97mm, 115mm or 130mm. 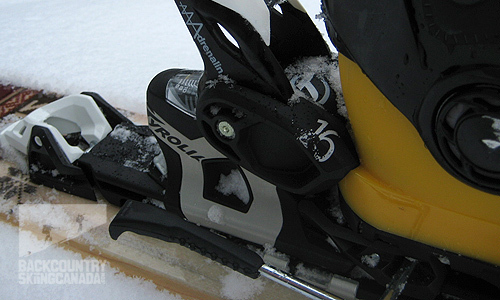 Given that the Tyrolia Adrenaline Bindings weigh almost six pounds I would not consider them in the category of a dedicated touring binding for multi-day tours or traverses (such as tech bindings). 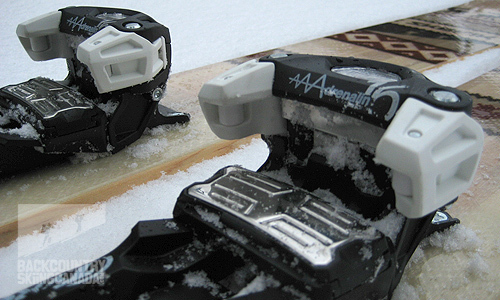 Where these bindings shine is for resort skiing with side country laps and small day trips into the backcountry. The Freeride touring binding market is getting pretty busy these days with Salomon and Marker already in this space so what advantages does Tyrolia offer that will make it a viable competitor? The first thing is weight; the Adrenalin bindings come in slightly lighter than others on the market while offering similar quality and durability without feeling bulky. Once you lock into the Adrenalines you will notice right away how solid they feel when compared to the lighter weight AT bindings offered up from Diamir Fritschi like the Freeride Pro. The second thing is that theTyrolia Adrenaline bindings are secure and very smooth in walk mode with no lateral play whatsoever. This is due mainly to the overall design as well as the right combination of metal and plastic to save on weight but not scrimp on quality. The toe hinge point is very smooth and located at the optimal position for a pretty natural stride pattern. 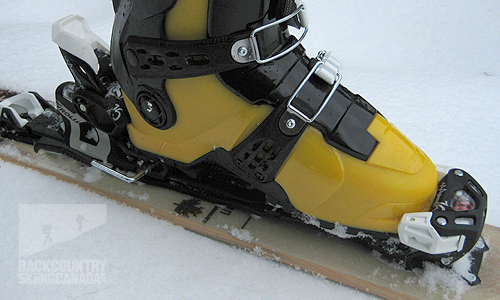 The long metal track on the ski and the three contact points of the locking mechanism underfoot provide a secure connection between ski boot and ski. The third thing is that there is zero play when locked down and therefore all of your energy is transferred into the ski and thus onto the snow so your skiing performance doesn't suffer. Combine this with the floating heel piece and you have a dynamic binding system that lets the ski flex as it was meant to. The switch from ski to walk mode is straight forward and uses the same motion that Diamir Fritschi uses so if you are familiar with the Freeride Pro bindings you will be right at home in the Tyrolia Adrenalines. To engage the heal riser it's just a flick of the pole as they are placed under foot where they make the most sense. The Adrenaline's wide platform allows them to easily drive today's fatter skis and we put them to the test with our Skevik Anton Skis which are 122mm underfoot. A wide ski such as the Anton deserves a wide binding that can drive it through powder and crud and that is exactly what the Tyrolia Adrenalines did with ease. On the down side I do think that having the binding platform that joins the toe piece and the heel piece made out of plastic is good for weight savings but not great for torsional forces and wear. 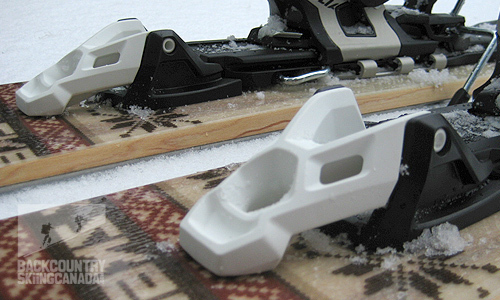 This design also posed problems with snow build up under foot on warmer ski tours. The negative space under the platform that is required for structural integrity is ideal for catching snow and packing it in these openings and that's just what it did on several occasions which prevented heal from easily locking back down. 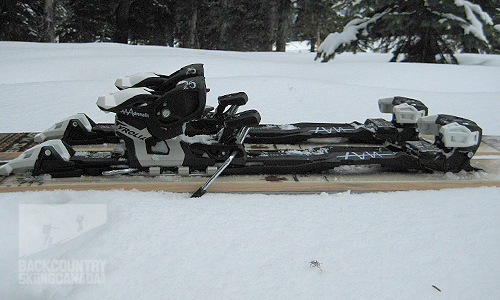 I had to spend several minutes prying the snow out of each recesses with my ski pole on a few occasions. A metal platform would provide the required strength without these snow collecting zones, however it would also add a few grams to the overall weight. On a similar note, from a physical standpoint the design of the heel release makes a lot of sense but from a practical and functional sense it doesn't always operate so smoothly when trying to re-engage it. Since the binding plate has to slide beneath you and it is metal on metal contact there is a lot of friction so a good deal of force is needed to move the mechanism and lock your heel back down. I found that using the a ski pole was not always easy so instead I got into the habit of using my hands. Not a show stopper but something to be aware of and in this case get used to. 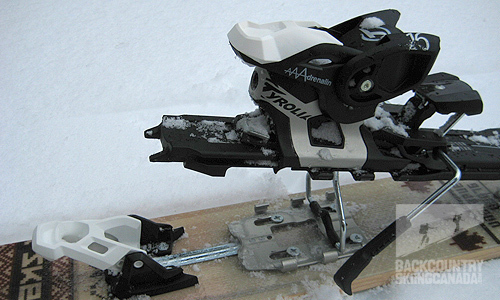 Overall the Tyrolia Adrenaline is a solid entry into the Freeride touring binding market for Tyrolia and as a first generation binding I think they have done an admirable job. The Adrenaline will compete well in this space and offer buyers a new and unique approach for their in-bounds / out-of-bounds binding needs. If you are looking for something a little less pricey and beefy then you should consider the Tyrolia Adrenaline 13 with a DIN that tops out at 13 (obviously) for $475 US or new for the 2013 season the lighter frame binding design of the Tyrolia Ambition 12 for $475 US.